Threatened to come under the wheels of that train wreck called global fiat money excess, a small Swiss right-wing party wants to reintroduce golden Franc coins and will discuss the issue later this year in parliament. Switzerland has reduced the gold backing of its currency only in the last decade, selling 60% of its gold hoard since 2000. The country currently hold 1,040 tons of gold. This has not damaged the safe haven status of the Swiss Franc, which appreciated markedly in the recent past against all other currencies. The Swiss economy is reeling under the strong Franc as the country's exports and its tourism industry have to digest a 16% upward move of the currency versus the Euro in the last two years. 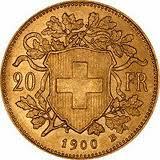 The Swiss Parliament is expected later this year to discuss the creation of a gold franc — a parallel currency to the official Swiss franc, with the fringe initiative likely triggering a broader debate about the role of the precious metal in the Alpine nation. The initiative is part of “Healthy Currency,” a campaign sponsored by politicians from the right-wing Swiss People’s Party (SVP) — the country’s biggest — that is seeking to capitalize on popular fears about global financial turmoil and inflation to reverse the government’s current policy on gold. Modest investors face several hurdles to investing in the precious metal, said the 50 year-old Jacob, a former pilot and currently a sales coach at Zurich Financial Services Group. Collecting coins, bullion and gold certificates typically requires professional advice and even the smallest coin costs around 100 francs. One of the new gold francs, on the other hand, with a gold content of 0.1 grams, could be purchased for just 5 Francs (at current prices). Jacob's Model would allow the private minting of gold coins and also wants to limit the autonomy of the Swiss National Bank, which lost billions in a futile attempt to stop the Franc from the revaluation. And he also wants Switzerland to ceasewithdraw its membership in the International Monetary Fund (IMF). The SVP, which also wants to limit the autonomy of the Swiss National Bank after it posted big losses trying to tamp down the franc, plans to start collecting signatures for a ballot initiative in mid August, according to Jacob. The party is demanding that the central bank stop any further bank sales, repatriate Swiss gold reserves held abroad, and not allow the proportion of its gold to fall below 20% of its total assets. The campaign is also calling for the country’s withdrawal from the IMF. Jacob, who claims to have no affiliation with the SVP other than the currency initiative, admits that the success of his gold franc campaign is linked to the amount of publicity the Healthy Currency initiative manages to muster at the end of the summer. “It would definitely put the parallel currency on the agenda,” he said. And it will be no easy feat. The passage of the legislation will require an amendment to the Swiss constitution and the country is not particularly well known for a reckless pace of change. If rejected, a popular vote — where ordinary Swiss people have their say — is planned, probably in mid 2012, according to Jacob. If approved, licensed financial institutions can then issue the coins, using their official logo on one side with the other, an easily recognizable Swiss gold franc emblem, Jacob said. The initiative foresees strict regulation by the government to ensure gold content and authenticity. It is a great initiative and I wonder why policymakers leave it to the nationalist camp to claim sane money models despite a growing feeling in all political camps that this 40-year excess of money creation will end in hyperinflation and has its roots in the principal problem of fiat currencies - the ability to create it at the will of central bankers who appear to long have lost all reason, driving the world with the lowest interest rates in history during the last decade into the biggest debt bubble in history. This will not end in a whimper but in a gigantic bang. Jacobs has to be credited to at least come up with a sound money model whereas the traditional banking community has yet to grasp that the global house of debt will crash onto itself, let alone that they would have come up with a single reform model that is basically a copy of the old -and bad - unbacked fiat money strategy.